When the era of CRT TVs ended, TV manufacturers are trying to create slimmer and better-looking designs. It’s great, but the downside is that there is not much room for nice sounding speakers and the ones that can be implemented produce only tiny and unconvincing sound. If you are low on the budget, but more importantly you don’t have much space to assemble the full blown 7.1 home theater, you may find soundbar as a great alternative. It won’t be as good as a surround system, but definitely better than thin television speaker sound. In this comparison, I’ll compare two popular soundbars: Bose SoundTouch 300 and Sonos PLAYBAR, both made by US companies. I’ll make a comparison between the most important categories, like the design, sound quality, features or ease of installation, showing pros and cons of each device. Without further ado, let’s look at the review. The design of a soundbar is not as important as sound quality or connection capabilities. But still, a soundbar is a part of the furniture and the looks play a big role here. You don’t want your guest to see a cheap looking piece of plastic bar lying under your television set. Don’t worry it’s not the problem for any of the models presented. Both of them look completely different, but decent at the same time. The Bose soundbar goes first. In my opinion, it looks better than Sonos. It’s 57 mm high and 978 mm wide. It won’t obstruct your TV as it stays well below TV sensors. It will fit nicely into your visual space thanks to its sleek and elegant look. Its design consists of a tempered glass (which is, of course, a fingerprint magnet) and wrap-around aluminum mesh with LEDs in the front. It stands out against plastic builds of lower price tag models. Sonos build is not as great as Bose. Don’t get me wrong it doesn’t look cheap, it just doesn’t have this premium feel. The soundbar parts that are not covered by a smooth soft fabric, are covered by aluminum. At 5.4 kg, the Sonos is heavier than Bose, but it’s not that important unless you want to take your soundbar on a trip. There is a lot to like about ST300 soundbar. When it comes to dialogues in movies, it does a great job of keeping the sound crisp and clear, thanks to the special dialogue mode. On the flip side, it can remove too much bass and the dialogues can sound a bit too sharp. The soundbar alone doesn’t produce as much bass as subwoofer because it doesn’t have woofers inside, but if you watched movies without a soundbar before, you will definitely see an improvement. There is no booming even when there is a lot of action, just a solid soundbar sound. If you prefer more explosive bass you can buy a subwoofer to have a punchier bass. If you want a full surround system, the soundbar can be partnered with additional speakers (for 299$). After you connect Sonos to your flatscreen TV, it’s clear that it’s a huge improvement over the most expensive TV sets. You will hear sounds that you haven’t heard before due to technical limitations of flat screens. Similarly to other soundbars, it doesn’t have woofers – this is a huge limitation to produce a truly great bass. Nonetheless, the bass is quite decent. But if you want to get the most from the explosion-packed action movie, the soundbar alone won’t deliver sounds at the very low frequencies. For this, you should consider buying a Sonos subwoofer. After you add the sub, you will notice that not only it improved bass, but also enhanced mid-range (which are not bad with the soundbar alone) details. Similarly to Bose, it offers a dialogue enhancement feature which can be enabled if dialogues are not intelligible enough. Sonos offers Bass, Treble, and Loudness controls to change the sound balance, although only slightly. There is one place where Sonos PLAYBAR really shines among other soundbars – virtual surround sound. It can generate sound that stretches to the full width of an average sized room and creates the illusion of sound coming from both sides. The PLAYBAR is able to decode two types of audio signals Dolby Digital and PCM. If the movie uses the first type of a signal, it can create a true surround sound. If it receives a PCM signal it will simulate the surround effect using its own processing rather than the original surround sound. Bose is newer than Sonos, so it won’t be a surprise that it offers a few more features. The first feature that I would like to notice is QuitePort. It is designed to give a distortion-free deep bass at any volume, without the need of adding a separate subwoofer. The next feature is the ADAPTiQ calibration. It will help you optimize the sound for your particular room. The PhaseGuide array technology, that was introduced in the first Bose soundbar is designed to separate channels of a soundtrack and push it wider than the size of the bar. When it comes to connectivity, the SoundTouch allows you to connect to the soundbar with WiFi or Bluetooth and stream from Pandora, Spotify, Deezer, Amazon Music and other music services. The soundbar comes with an HDMI-ARC connection that offers 4K with Dolby Digital and DTS decoding. It also offers a 3.5 mm subwoofer out. Sonos PLAYBAR is older than Bose Soundtouch. But still, it offers some neat features. One of them is Night mode. It works in the way that the silent sounds like whispering are audible and at the same time the loud parts of a movie are not overpowering. Dialogue enhancement makes speech easy to hear, even if there are other distractions. You can enable both of these features at the same time or use them independently. Similarly to Bose it offers a WiFi feature but lacks Bluetooth. You will have to depend on the Sonos mobile app because it’s the only way to set up the bar. When you use this app, your phone doesn’t have to be in a range because it doesn’t send music via Bluetooth, instead, it works like a remote controller and streams music directly from a music service. Additionally, it offers the Sleep Timer and Alarm modes. A Sonos application, as a part of Sonos system, will notify you of available updates, which usually include enhancements and new features. PROS: Bluetooth / WiFi / HDMI-ARC / Wide sound field / Good dialog enhancement features / Easy-to-use music streaming / Great design and build quality / 4K pass-through / expandable / Loud, expansive sound. PROS: Easy setup / Easy to control / Decent sound / WiFi / Simple to set up / Expandable / Virtual surround effects / Wireless sub and satellites / Great apps. CONS: Small rear speakers / The sound bar’s wide effect only works with bare, unobstructed walls / Frustrating setup / Dialogue can sound a little sharp / Expensive. CONS: The Sonos app is required to use the soundbar / Cannot play music directly from other applications / No 4k Audio compatibility / Still uses optical cable / No HDMI / No Bluetooth / Expensive / No remote in the box / Cannot handle DTS soundtracks. 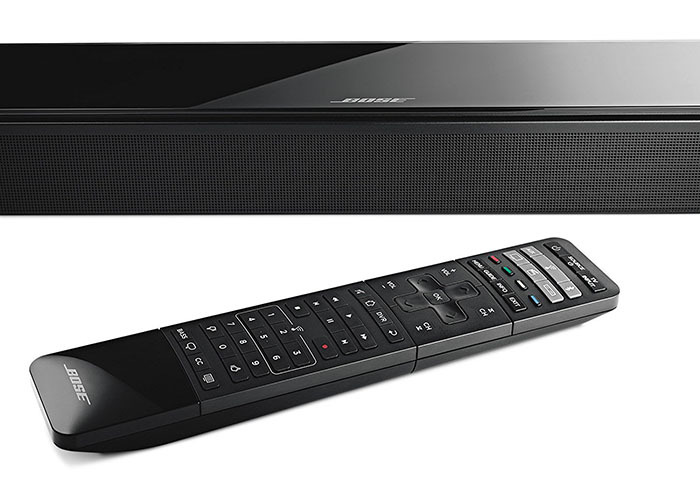 Bose is definitely a good looking soundbar that will add a premium feel to your room. It’s more modern than Sonos and offers 4K HDMI and Bluetooth connectivity. Sonos is not that advanced as Bose and it doesn’t offer Bluetooth, so streaming music directly from your phone is not possible. On the other hand, the Sonos app works really great giving you much bigger range than the Bluetooth connection. The virtual surround effect is great and you can’t get it elsewhere without spending more.